Jose Antonio “Nick” Barrios, owner of three Vintage Wine and Liquor stores in Miami, Florida. An American Tradition Lives On with Mom-and-Pop Merchants from six Continents. From colonial times to the present, America has welcomed immigrants. The words inscribed on the plaque at the foot of the Statue of Liberty in New York Harbor proclaim—“Give me your tired, your poor, your huddled masses yearning to breathe free….”—and are enshrined in our nation’s conscience and consciousness. American history is rich in connections between immigrants and alcohol. Our earliest colonies brewed beer, imported Madeira and rum, and distilled spirits from corn, rye, and molasses. Thomas Jefferson tried time and again to grow grapevines shipped over from France and Italy at his beloved Monticello. Three-thousand miles west, Spanish colonists in what is present-day California had better luck during the 16th and 17th centuries, building a chain of religious missions, after which the Mission grape is named and is still cultivated to this day. All by way of saying, America’s beverage alcohol business could not have evolved as it has without wave after wave of entrepreneurial immigrants entering the wine, spirits and beer businesses. Before and after Prohibition, ambitious, risk-taking first-, second- and third-generation immigrants were present at all three tiers of the beverage alcohol industry, but have proven especially successful at the retail level in recent decades. With roots as varied as Africa, Australia, the Caribbean, China, Eastern Europe, India, Latin America, the Middle East, Russia, Southeast Asia, South Korea, and not to forget Western Europe, these merchants add spice to the diverse cities and towns they serve. 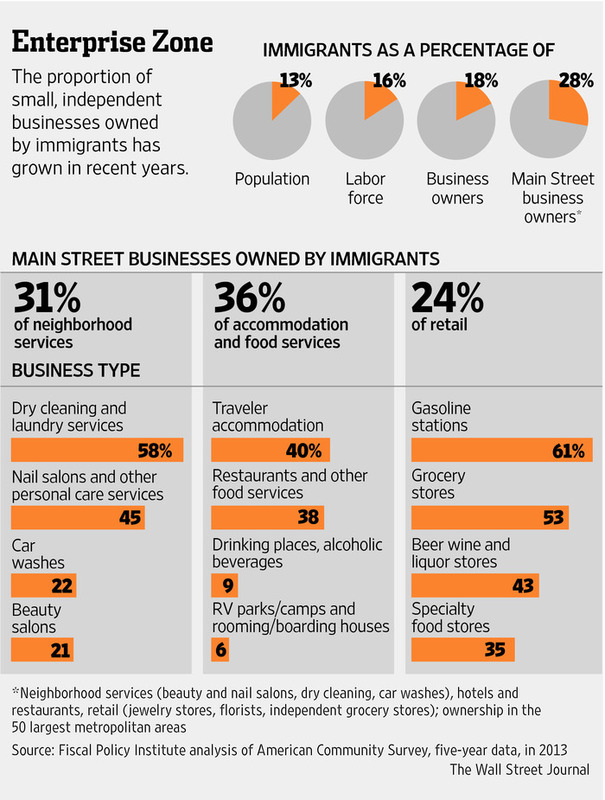 A recent front-page Wall Street Journal story reported on a study crediting immigrants with all the growth in so-called Main Street businesses from 2000 to 2013, including 31 of the 50 largest metro areas. The author of the report, David Kallick, specifically praised the role these immigrant-owned businesses have played in “neighborhood revitalization.” No dry economic verbiage needed: mom-and-pop wine and liquor store owners are playing an ever-growing role in generating jobs, growth and opportunity in the neighborhoods they live in and serve. 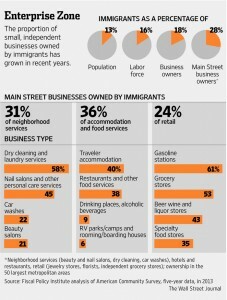 Published on January 13, 2015, this report from the Wall Street Journal underlines the outsized contribution to U.S. economy and employment in recent years achieved by immigrant entrepreneurs on Main Street. Consider them a quiet but potent force. According to one senior multi-state wine and spirits wholesaler, in markets like metropolitan New York, New Jersey, Florida and California, first- or second-generation immigrant mom-and-pop retailers and restaurateurs can account for as much as 20% to 30% or even more of a distributor’s entire statewide business. Lucas Huang, owner of Derby Liquors, Brooklyn, NY. 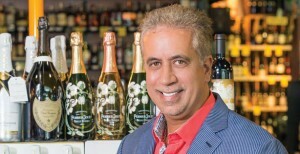 In the tri-state area alone—New York,New Jersey and Connecticut—the Asian-America Retailers Alliance (AARA) represents more than 2,000 members who own wine and liquor stores, convenience stores, and gas stations, says AARA Coordinator Samir Patel, who immigrated from India. Patel says that the group’s annual trade show—September 10, 2015 in Edison, New Jersey—attracts scores of wine, spirits and beer suppliers, importers and distributors seeking to grow their trade with these AARA entrepreneurs. Coming from a convenience store background in which stocking inventory was not so expensive an outlay, Patel soon discovered selling fine wine and spirits is an extremely capital-intensive exercise. Another ongoing challenge, says Patel, is the constant need to acquire more product knowledge. “I am still learning; with wine and liquor you have to learn a lot,” notes Patel, who is very proud of the fact that now customers ask him for recommendations, and he is able to describe products in terms that inspire confidence and repeat business. Owner now of three busy Vintage Liquor & Wine Bar locations, Barrios recalls one critical secret his father shared early on: “Remember all the pricing in your head. And to do what you promise to do.” This discipline, first honed as a young employee in his father’s supermarket, proved crucial in capitalizing on the ins-and-outs of volume discounts and other pricing essentials when dealing with distributors. Each Vintage caters to a different clientele. The Pinecrest location welcomes to a diverse base of upscale customers who are quite wine-knowledgeable, notes Barrios. That store is Vintage’s largest, featuring a walk-in fine wine cellar with 1,500 selections. Their Midtown Miami location is situated in a growing neighborhood with many young professionals moving in. And Brickell, also growing fast, has a significant Latin American population (including owners of many second homes). One common denominator tying all three locations: an extensive selection of single malt Scotch and Bourbon. 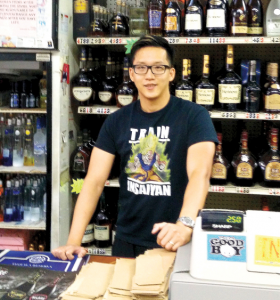 Lucas Huang is a young Chinese-American wine and spirits retailer who also started at a family grocery, where he learned the basics of service and buying. When he and his mother, Lily, elected to switch careers and buy Derby Liquors, a small wine and liquor store at 2123 Nostrand Avenue in the Flatbush neighborhood of Brooklyn, location was a key—Huang lives just five minutes from the store. More than half of Derby’s customer base is African-American; the balance consisting largely of Jamaican and Haitian patrons. Huang adds that he has worked hard to remember how each wine tastes, as more and more customers are asking about the store’s growing selection of varietal types he is stocking. He also happily takes on brands his customers request. Of late, Hennessy Cognac, Brugal Rum from the Dominican Republic and Moscato wines are the top three sellers at his store, which is staffed by his brother Ken, his mother and himself. Edmund Braithwaite, owner of Nostrand Wine & Liquors in Brooklyn, New York. 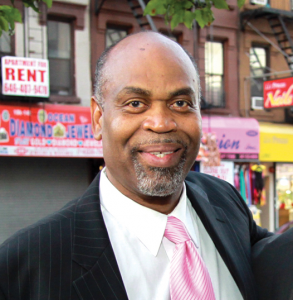 Nine miles west, but a world away from Derby Liquors, Edmund Braithwaite, a Guyanese-American retailer, owns and operates Nostrand Wine & Liquors, acquired in 2002 from a retiring merchant, situated between the Crown Heights and Bedford-Stuyvesant neighborhoods in Brooklyn. Not far from the famous Brooklyn Botanic Garden, the neighborhood has changed dramatically since Braithwaite first opened. A former senior regional executive for Staples, Braithwaite “downsized” his management skills from typical 40,000-square-foot store to a more manageable (at first), 1,000 square feet at his first location. Andrea Herrera is General Manager of El Cielo, a Colombian-owned restaurant opened in Miami’s chic Brickell neighborhood earlier this year by famed Colombian chef Juan Manuel Barrientos. With a strong lunch, after-work and dinner business driven by clientele of Caribbean and Latin American descent, beverage service has been a key driver in the location’s success, reports Herrera. “Overlooking Miami Bay, we have a beautiful location and we are very near the top financial and cultural institutions in downtown Miami; business has been huge since we opened,” says the Colombia native and 17-year resident of Miami. Key for repeat business here is how the innovative tasting menus and small plates dovetail with the spirits and wine service. Popular pours include Pisco Sours, Coconut Rum Daiquiris mixed with Macorix, the trendy rum from the Dominican Republic, and fine wines from $70 to $3,000 a bottle. As our American ethnic quilt becomes more varied, these enterprising immigrant retailers and restaurateurs, and their increasingly diverse customer bases, are certain to become more important customers to both distributors and suppliers in the beverage alcohol business, not to mention our economy. The author wishes to thank Beverage Media for permission to publish this article, which appeared in the September 2015 issue of the publication.